Don’t worry, no actual Great Pumpkins were harmed in the making of this cake; it’s vanilla ice cream layered with mini chocolate chips. Yum. And hey, an adorable store-bought cake means one more thing to cross off your party-planning list. We’d rather spend our time plotting against the Red Baron. 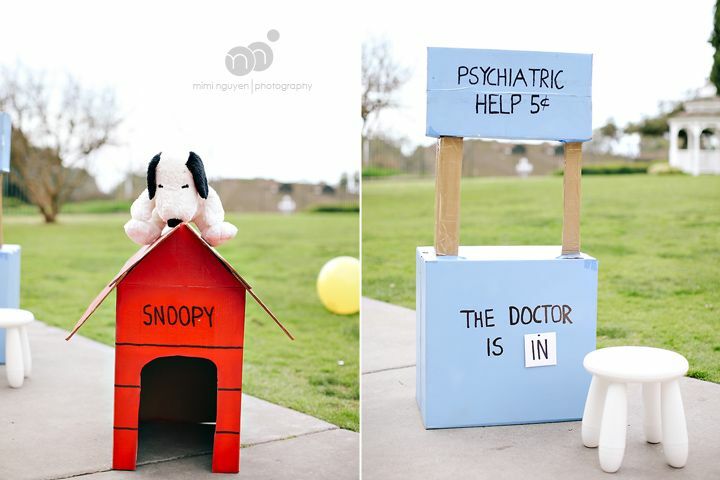 Or you know, just putting together these Peanuts party activities below. Alternatively, we also found this affordable, ready-made Peanuts photo booth backdrop at Oriental Trading, with a cute Snoopy and the Great Pumpkin theme. This is such a cute idea for you crafty parents via Hostess with the Mostess: Create a DIY balloon pumpkin patch! She has the tutorial on her site, including how to fill them with treats. You can use them as decor, and then later in the party, let each kid pick one to pop for surprise treats inside. 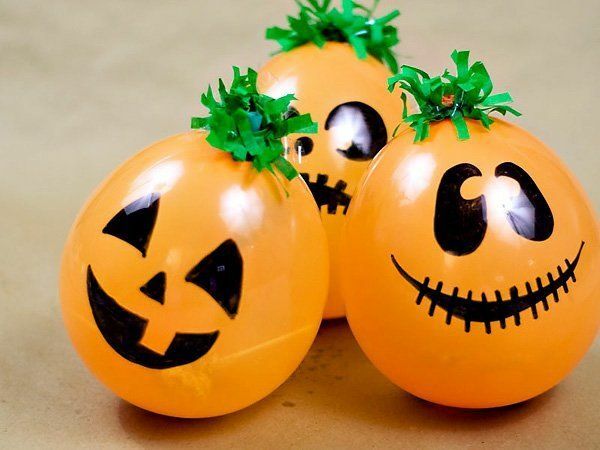 Or, you can even have kids decorate their own Great Pumpkin balloons (should you trust them with Sharpies) as a fun Peanuts party activity. 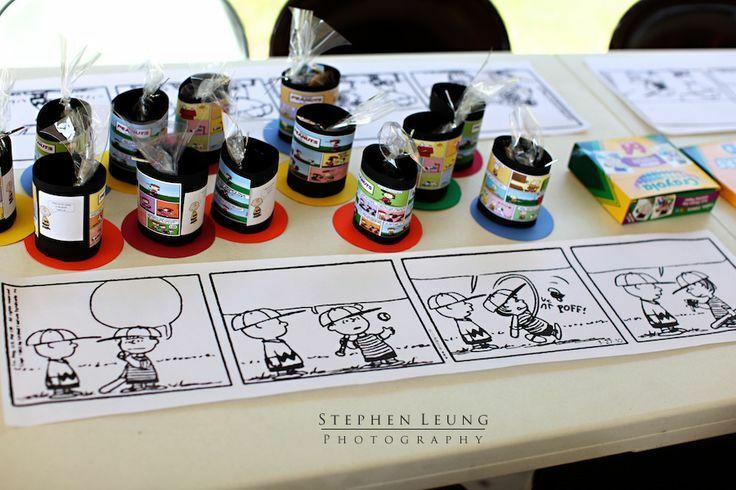 It would be awesome to give the kids a chance to make their own Peanuts comic strip at your Peanuts party, like this giant one captured by Stephen Leung Photography. It just requires finding a strip with decent sized resolution, and printing it on giant paper — or attaching several sheets together to cover the table. Alternatively, we visited the official Peanuts website and simply saved an image file of some of the comicstrips. Then in PicMonkey, just use the pencil tool at the bottom of the effects menu to “erase” the copy with white. Not that anyone could ever be as awesome as Charles Schulz, but we can’t wait to see what our kids come up with. We were once at a Disney event where the kids learned to draw Mickey and Goofy, and they totally loved it. So we thought it would be fun to try that with the peanuts characters. 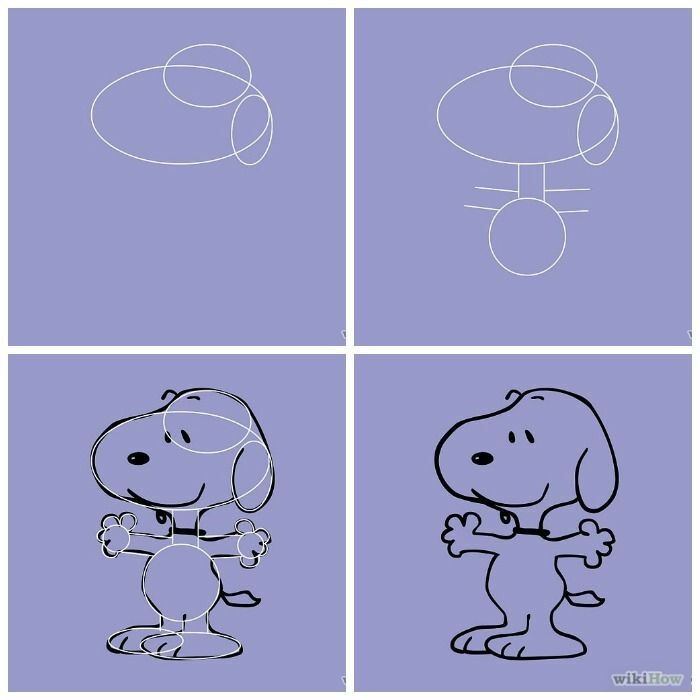 If your kids are a little older and really want to show off their illustration chops, we found this tutorial on WikiHow for how to draw Snoopy using basic circles and other shapes. 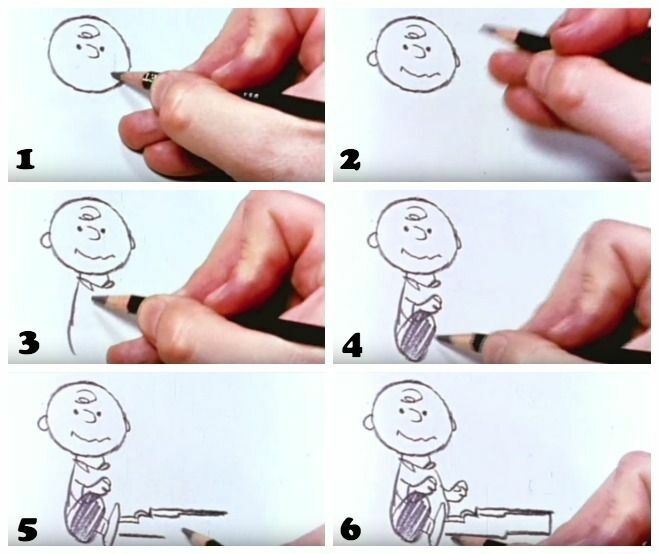 Or, check out the cool YouTube video of Charles Shultz drawing Charlie Brown (with some great narration about his cartoon alter-ego, too). It’s neat just to watch, but it’s easy enough to screenshot it in segments like we did here, then set it out for kids to try and copy. 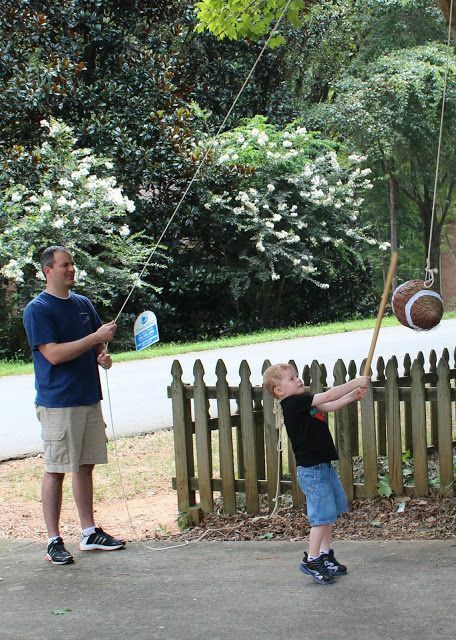 So maybe Charlie Brown never got to whomp that football, but your kids can have a shot at it as a football pinata, like this activity, one of lots of great ideas from the Harris Sisters’ own Peanuts birthday party. So much good stuff there. We also like her ideas to retheme classic party games like musical chairs with names like “The Peanuts Shuffle” or having an orange water balloon “Great Pumpkin Toss.” Smart mama! While the Peanuts Pumpkin Harvest Ice Cream Cake is adorable, if you just can’t have a Peanuts party without Snoopy, also check out the Peanuts Snoopy Flying Ace Cake at ILoveIceCreamCakes.com. On the site, you can use their store locator tool to find some of these awesome cakes in a grocery store near you. You can also get $5 off your next ice cream cake by joining the Crunchie Club (how cute is that?) on the site, along with some online coupons and deals. Sweet! Tip: One of our favorite ways to serve ice cream cake at parties is to slice up the cake and use it as the base for a DIY ice cream sundae bar. Set out fun sprinkles, hot fudge, candy corn, caramel sauce and other favorite toppings. Kids love it, plus it helps stave off the debates about who got more clouds or who got more of Snoopy’s face on their slice. 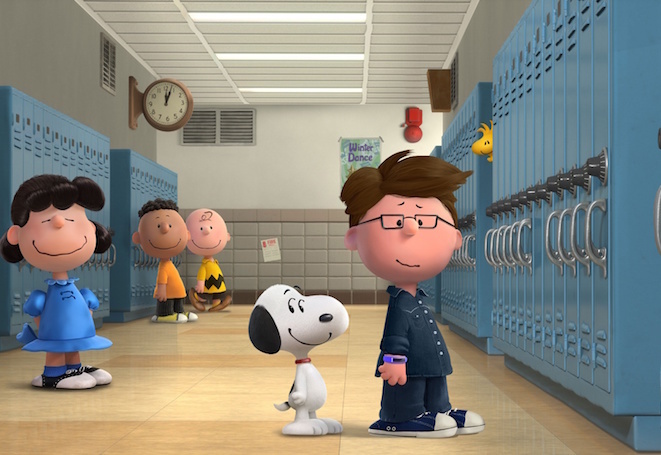 On the Peanuts Movie site, we recently shared the fun Peanutize me page which lets you turn yourself into your own personalized Peanuts character. Open the laptop or iPad and let each kid have a turn creating their own, then send them home with a fun little favor they can pin to their bedroom walls. 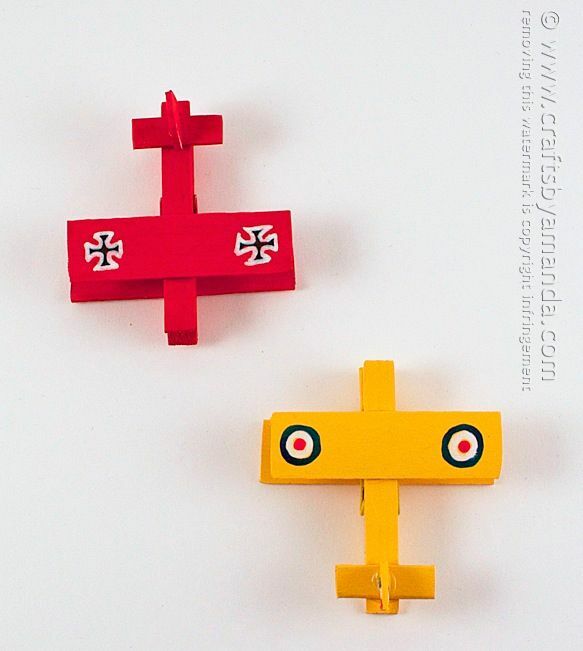 We love the idea of setting up a crafts area for the kids, where they can make DIY Snoopy’s Red Baron airplanes out of clothespins. At Crafts by Amanda, you’ll find a great tutorial and some very cute photo inspiration. So smart! And if your kids aren’t old enough for craft knives, we recommend assembling the planes first and letting the kids paint and decorate at the party. Stickers, paint, glue and construction paper — you name it. 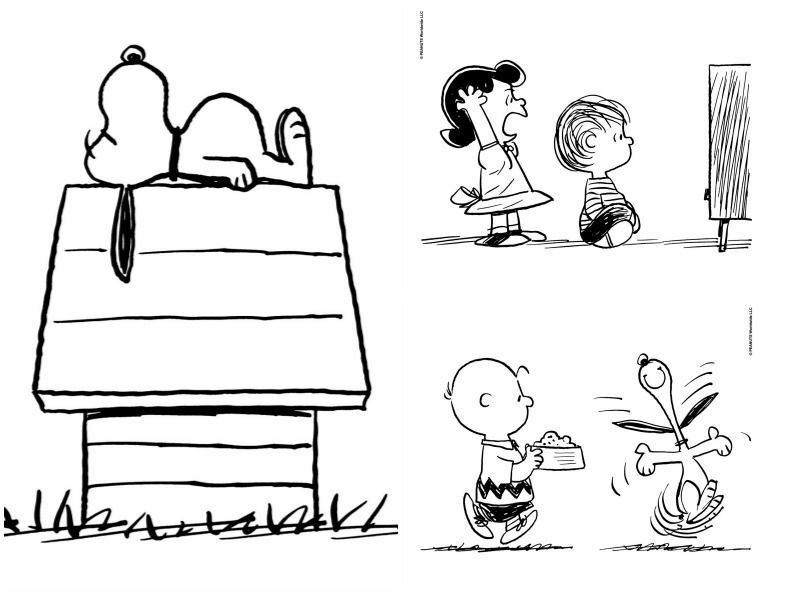 World’s easiest party activity to keep the kids busy at all times: At the official Peanuts site, they’ve got 10 free Peanuts coloring pages you can download and print. We highly suggest you visit the site, because if you search “Peanuts coloring pages” you’ll have to click through lots of scary, spammy coloring page sites that just might offer a free computer virus along with your download. Whether you’re setting up a screen outdoors in nice weather, or splayed out on the floor around the big TV in the house, it’s nice to have a little quiet time watching It’s the Great Pumpkin, Charlie Brown or whichever Peanuts film is in season at the time. 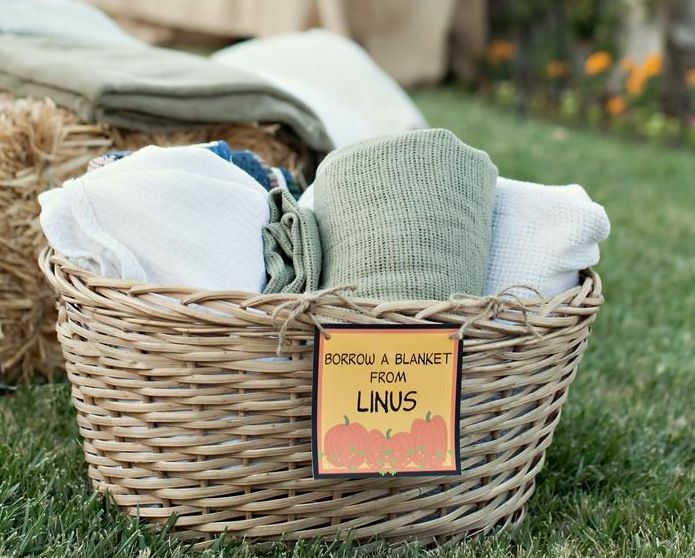 To make things more fun, we absolutely love this borrow a blanket from Linus idea at Kara’s Party Ideas. It’s so brilliant, and you can just roll up the extra blankets you have around the house. Or, if you want, you can even grab these kid-sized Peanuts beach towel we found for each guests that double as take-home party favors. 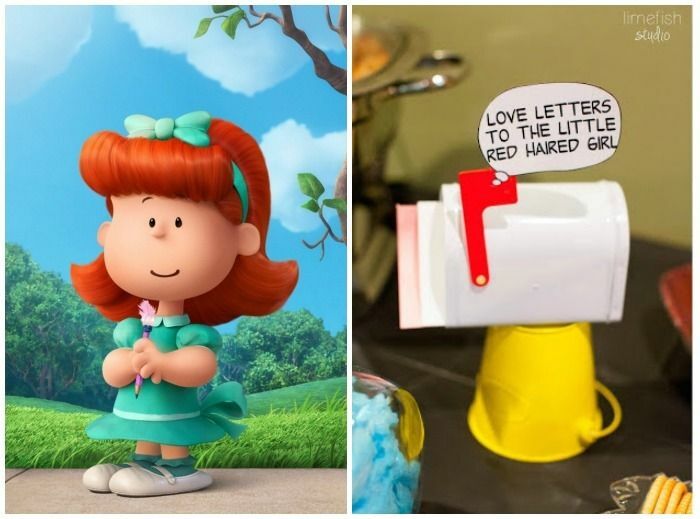 If you’re celebrating a birthday at your Peanuts party, ask guests to leave notes for the birthday boy or girl in this cute DIY love letters to the little red-headed girl mailbox that we fell in love with from Limefish Studio. Of course, you could tweak the sign to suit your little brown-headed or blonde-headed child too. Or, younger kids could just decorate tiny notes with heart stickers and pop them in. These free printable Charlie Brown and friends papercraft figures from Toy a Day are a great party favor for older kids that they can make themselves as a craft activity. Our more imaginative kids will have a blast creating their own Peanuts stories for these guys to act out. And hey, no glitter mess to clean up! Also check out Snoopy and Schroeder and his piano. 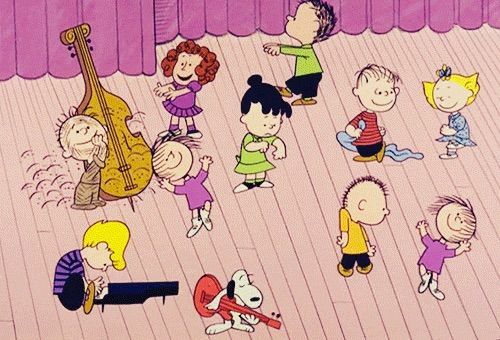 You know what we’re talking about — those awesome Peanuts dance moves the gang does to that iconic Vince Guaraldi tune during all their parties and dances. (It’s actually titled Linus and Lucy. Who knew?) There are about ten different moves if you look closely, from a Frankenstein walk to a kind of 80s Molly Ringwald head bop thing. Show the kids, assign them each a character, pump up the volume and party like it’s 1969. Thanks so much to our sponsor ILoveIceCreamCakes.com for making things adorable, fun, and easy for busy parents who want to throw great parties for our kids. 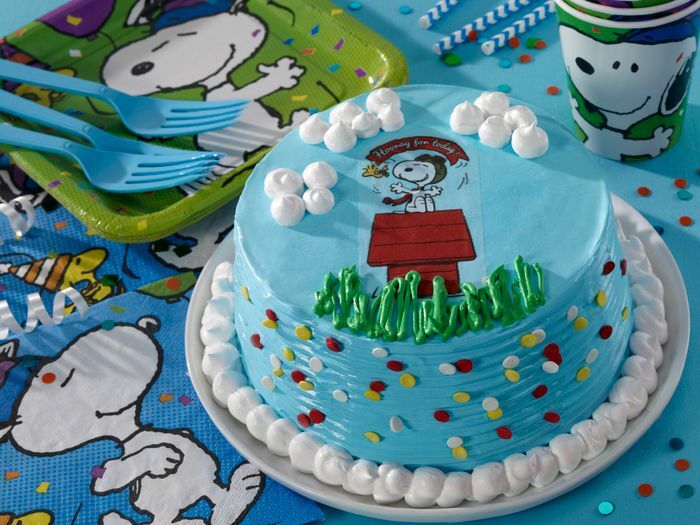 Be sure to look for their adorable Peanuts Harvest cake and Peanuts Flying Ace ice cream cake in your grocery store’s freezer aisle, either of which will definitely be a highlight of any Peanuts party.